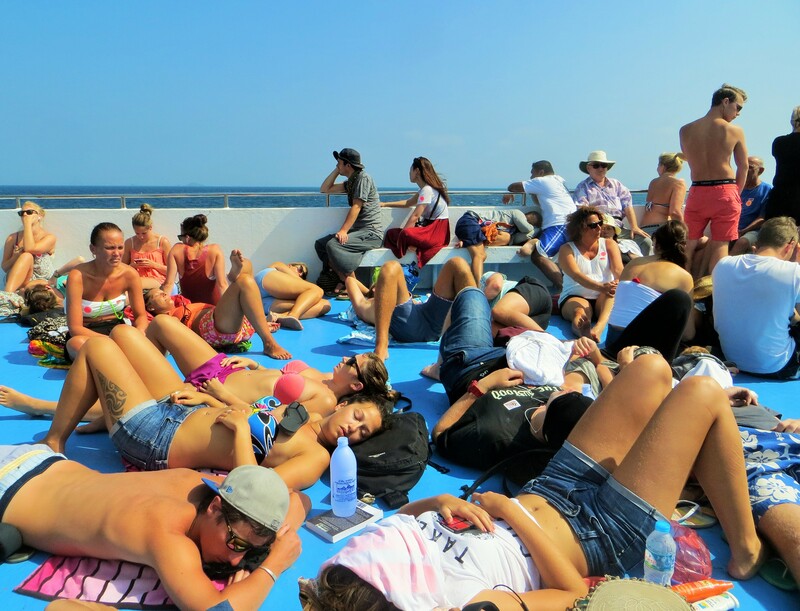 Hop onto a crowded ferry with us for about four hours, and land in paradise on the island of Ko Lanta. 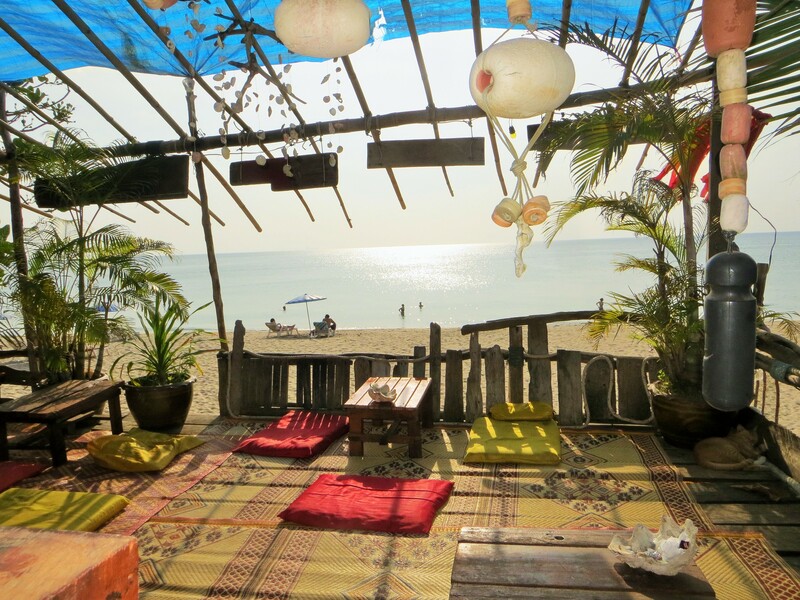 A laid-back place to chill that’s secluded from the crowds. The ocean view from our porch makes it hard to pull ourselves away to explore the rest of the island. So, let’s take another Thai massage, which is similar to Rolfing but only costs $10 an hour. It hurts! Think I prefer the Aloe Vera rub. Time to rent a scooter and ride (wearing bathing suits) around the entire island in about five hours. What a great way to explore the islands! Hard to keep your eyes on the road. Gold and white-sand beaches surround the many turquoise bays that appear, as we emerge from the curvy, jungle road. 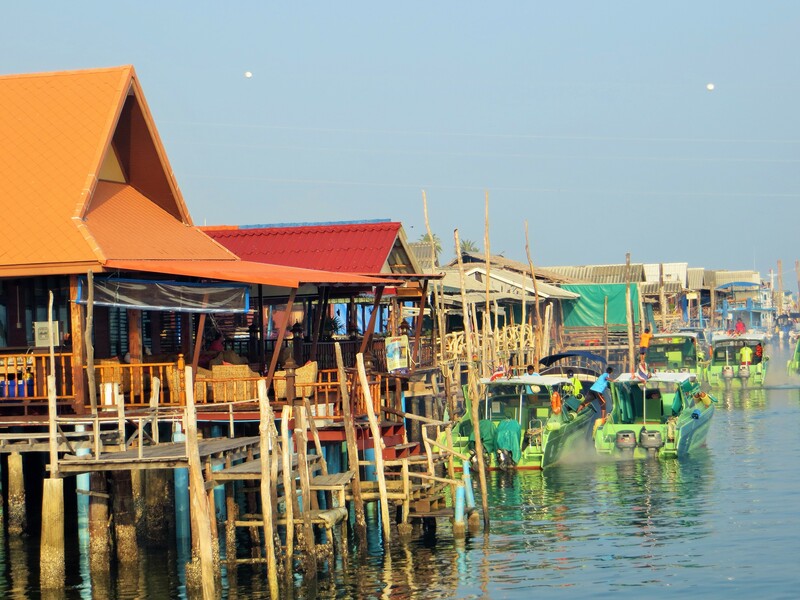 Stilted villages remind us that we’re far from home. 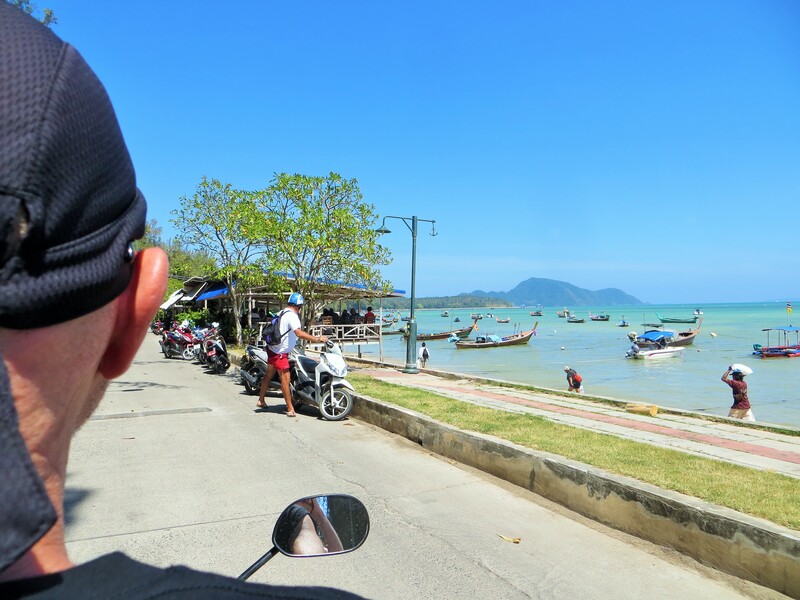 When the road twists into town, the scent of delectable Thai street food, fried and barbequed prawns, squid, chicken, tofu, pineapple, spring rolls, etc., lures us to stop for a feeding frenzy, along with a cold beer. A visit to a Reggae Bar can really top off a sunset…Yeah, man. 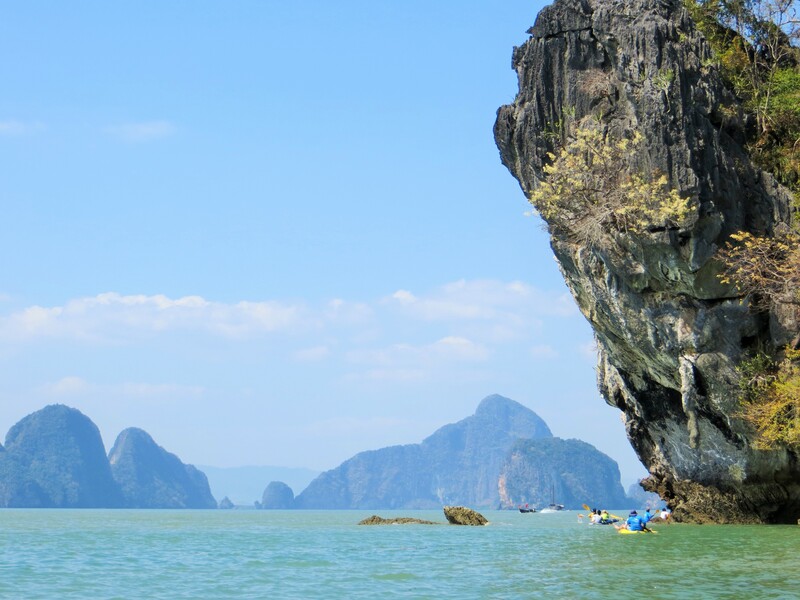 We ferry from the paradise of Ko Lanta, to another bliss on the popular island of Phuket. It’s a bit more crowded, but still laid-back, and offers more options. We could stay here forever for the fresh seafood alone. Since our room in Phuket has a kitchenette, we scooter to a seafood market and purchase humongous shrimp…four of them weighing one kilo! I sauté those beauts in coconut oil and garlic, for a romantic dinner on our balcony. Bring on the giant prawns. Mostly, though, we just kick-back on the beach. 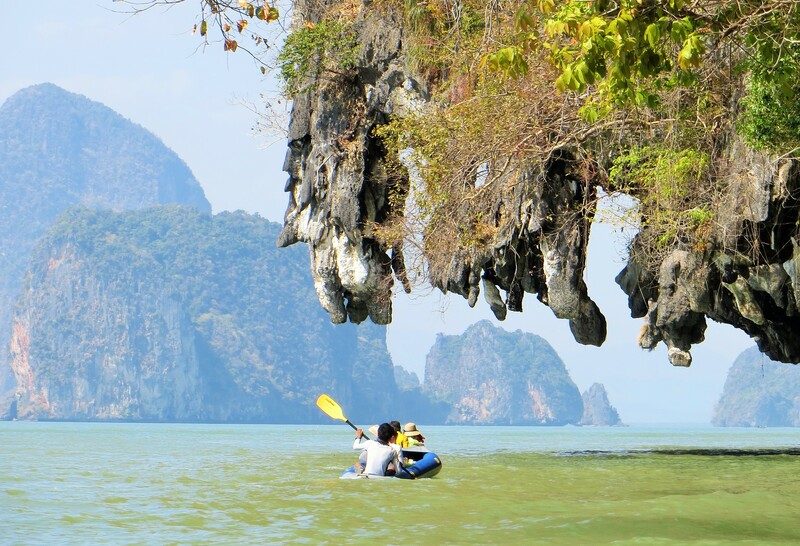 Our one and only organized tour thus far, “Hong by Starlight,” floats us on kayaks through caves that emerge at low tide, from beneath jungle-covered limestone cliffs. 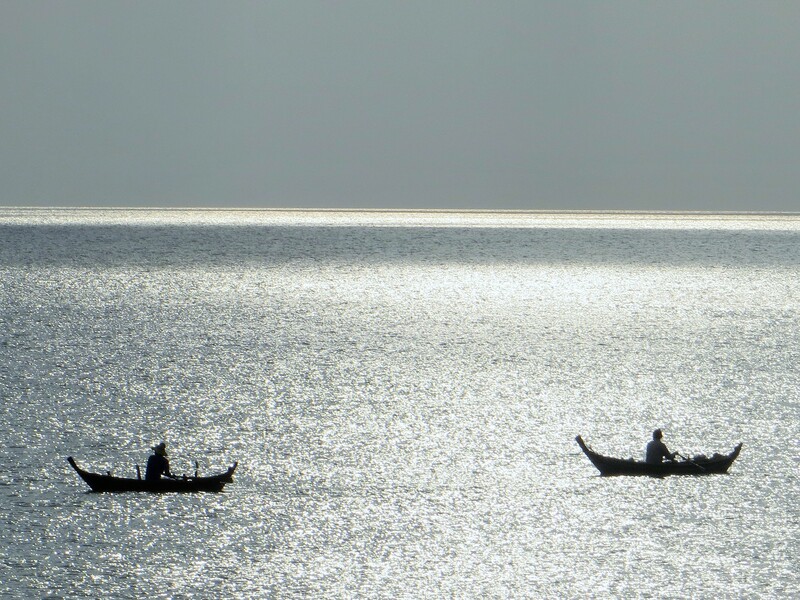 Gentle seas and spectacular scenery. Talk about tranquility…at sunset we kayak into the darkness of a cave, where we first make a wish, and then light a candle that is on a little flower-floating-thing (Krathong) before releasing it to drift on the water into magic of Hong. 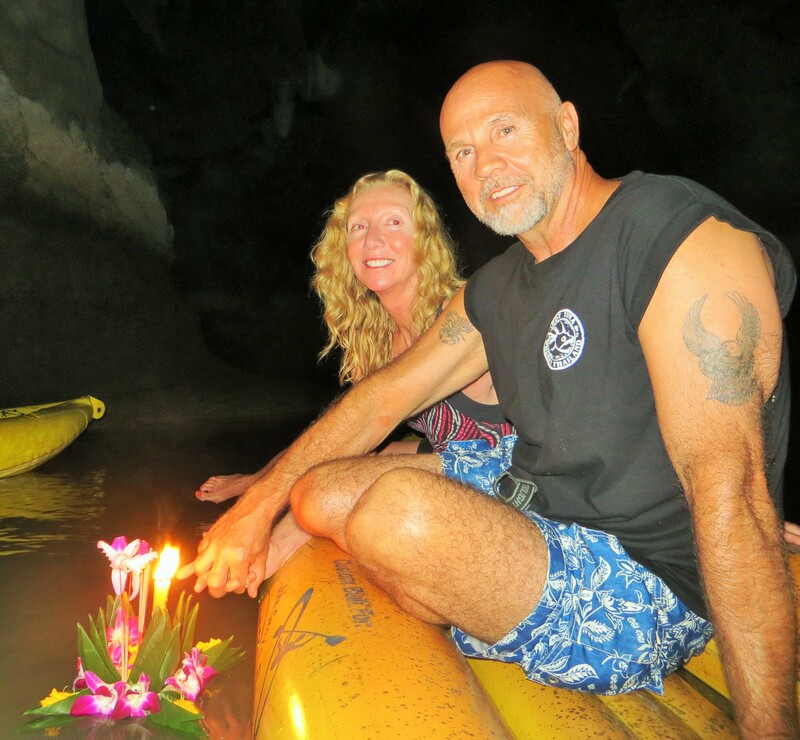 Launching our Krathong in a cave on Hong Island. Thanks, Hal. Yes, traveling is a passion that Marilynn and I share. We’ve found traveling to be less expensive than living at home, but you have to have lots and lots of time to do it that way. Spreading friendship and goodwill around the world. Thank you, Tammy! Hugs to you too. I felt relaxed just seeing these pics. A bit jealous! Vicky, put this place on that list! Oh my, that looks entirely too heaven on earth! 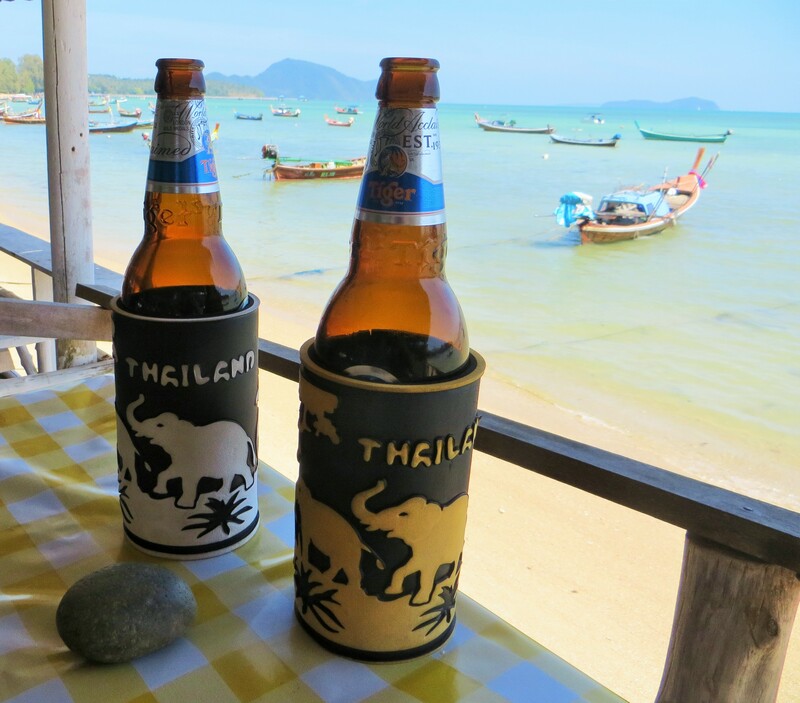 Spending more time in Thailand has been on my bucket list for years….ahhh. wow. Alas any spare $$ i acquire this year needs to go to mundane things like painting my house, a new washer-dryer, etc. Yawn. And retirement? never gonna happen. I will experience the life I want to lead through your blog. (Oh it’s not that bad for me…but still). C’mon Jill, find a way to escape! We hope to see you this summer in the great northwest. The food look amazing !!! 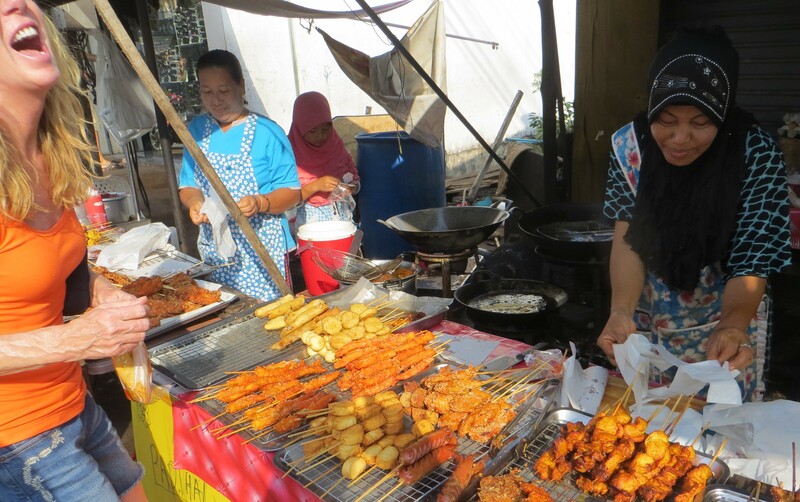 Oh, the food…so good that I took a one-day cooking class during our travels. Highly recommended!